Acid deposition and its effects is a long-standing research interest. Acid deposition is elevated concentrations of strong acids that are deposited to the Earth’s surface as a result to emissions of fossil fuels. This input has resulted in adverse effects on aquatic organisms and trees. Emissions of acidifying air pollutants have peaked in the U.S. and have decreased in recent decades, due to air quality legislation and rules. With the help of Zhengwei Wang, a visiting scholar from the Chinese Academy of Sciences, a synthesis of acid deposition and its effects was completed for the Encyclopedia of Water: Science, Technology, and Society (Driscoll and Wang in press). With the New York State Department of Environmental Conservation and the Adirondack Lakes Survey Corporation and the U.S. Environmental Protection Agency, we monitor the chemistry and fisheries of 52 lakes in the Adirondacks. Our work shows that inputs of acid deposition have decreased markedly in recent years due to air emission control programs (Figure 1) and this has resulted in some improvements in the chemistry of acid impacted streams and lakes in the Northeast. Figure 1. Long-term trends in atmospheric deposition of sulfate and nitrate in precipitation and from gases and particles at Huntington Forest in the Adirondack region of New York. 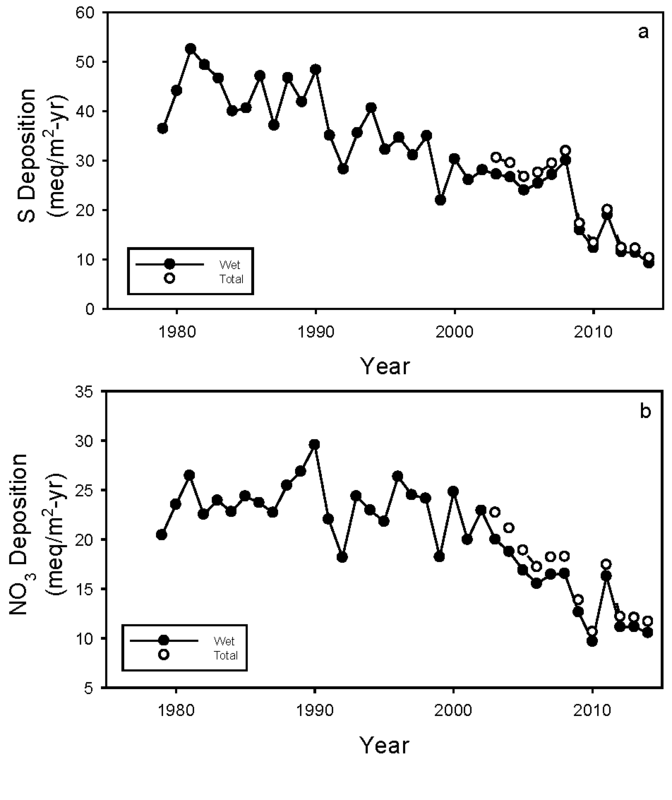 Atmospheric deposition of sulfate and nitrate have decreased markedly in response to emission controls. An unintended consequence of decreases in acid deposition is a phenomenon called “browning”. Browning is an increase in the mobilization of dissolved organic matter from soil to surface waters. Browning is evident in many Adirondack lakes and other waters in the eastern U.S. and has important water quality implications, including increased transport of nutrients and trace metals, increases in water treatment costs and changes in the thermal stratification of lakes. Yaskira Mota, a MS student, examined the influence of browning on the thermal stratification of lakes in the Adirondacks. Figure 2. 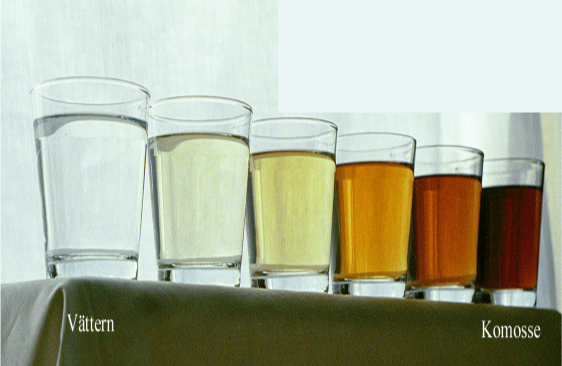 Photo of showing waters with increasing concentration of dissolved organic matter. In addition to long-term monitoring, we have been conducting watershed modeling to evaluate the recovery of ecosystems in response to control measures on atmospheric emissions. Using the watershed biogeochemical model PnET-BGC developed in our lab, Shuai Shao, a Ph.D student, is using PnET-BGC to assess past acidification and project future recovery of watersheds to determine critical loads of acidity of streams in the Adirondacks. This work is nearly completed and he is working on a journal article summarizing his research. Figure 3. Mean (± standard deviation) of model-predicted selected stream and soil chemistry variables for the 25 simulated Adirondack streams during hindcast (1850– 2012) and forecast (2013- 2200) projections. Future projections are shown under the “business-as-usual” scenario. In addition to these monitoring and modeling activities, we have been working on strategies and experiments to mitigate effects of acid deposition. We have an ongoing study at the Hubbard Brook Experimental Forest, NH examining the effects of calcium supply on the structure and function of the northern forest, through experimental addition of wollastonite (CaSiO3) to a forested watershed. In addition to mitigating the effects of acid deposition, there is interest in this experiment from the standpoint of “enhanced mineral weathering”. Enhanced mineral weathering is a land-based carbon dioxide removal strategy to accelerate delivery of inorganic carbon and alkalinity to the oceans. Enhanced mineral weathering requires research and verification in the form of long-term field trials, but has a range of co-benefits for agriculture and forestry. The wollastonite addition experiment is the first catchment-scale enhanced mineral weathering experiment. A paper summarizing the effectiveness of “enhanced mineral weathering” is in review in Nature Geosciences (Taylor et al. in review). Driscoll, C. T. and Z. Wang. In press. Ecosystem effects of acidic deposition. Chapter in Encyclopedia of Water Science, Technology and Society. Taylor, L. L., C. T. Driscoll, P. M. Groffman, G. H. Rau, J. D. Blum and D. J. Beerling. In review. Increased carbon capture by a silicate-treated forested watershed attenuated by acid deposition. Nature Geoscience.